Writing a book is one thing. But what happens when people wish to take that book and turn it into another form? Film, audio, theatrical play? Over the years books of mine have been turned into plays, and audio books. There have also been efforts to turn the books into film, but none have ever materialized. I have been asked for permission to reshape some of my books into operas. Nothing came of those ideas, either. 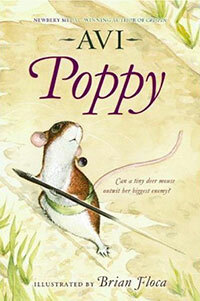 A school requested permission to turn Poppy into a ballet. That happened. It was, shall I say, curious. And there have been adaptations of some of my books into theatrical plays. I have no doubt that there are authors who fully engage in such projects. I have generally declined to become involved 1) because I don’t usually know the form, 2) I fear it will take up a lot of my time, and 3) nothing much happens anyway. 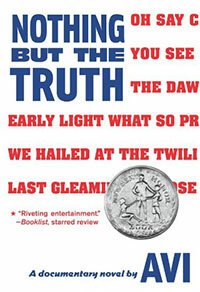 When Nothing but the Truth was first published, because of its format, I had many requests to turn it into a play. At first I said yes, but then was burdened with the need to read these many stage-revisions. What I did then was go to a playwright friend of mine, Ron Smith, and asked him to do an adaptation. That he did, and it was made available to the public as an “authorized” script. It’s still available, and from time to time it’s performed. Not that I have ever seen it on stage. Other books have been turned into theatrical form. In most cases these are adaptations, not very close ones, either. Crispin was once staged. I never saw it. I did see a stage production (professional) of True Confessions of Charlotte Doyle. It seemed as if I was seeing a cartoon of the book, a musical comedy without the music. Other such adaptations have been made and from time to time they are performed in schools. I’ve never see one. Film is another matter. When I have signed such contractual options, I am not given script control, but usually have the right to react to the film script. When I first see these scripts, they are usually pretty close to the book. Revisions have proved far less connected to the book. In any case, the projects have not gone forward. Audio books are a whole different matter. Such recordings are usually presented as unabridged, complete texts. Indeed, they are. 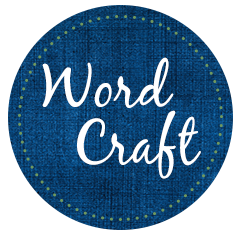 Moreover, the readings are professionally done, indeed, very well done. Nonetheless, I find them hard to listen to. They seem so very different than the book that is in my head. Very fine, but different. Different cadence. Emphasis. Emotional tone. I recall that the first time I listened to such a recording, my thought was, that seems better than what I wrote. They’ve done some rewriting. I checked, but it was all my words. It just sounded so very different. Could I refuse all these projects? Well, yes. But the thinking is always, it can’t be that bad. And the most important thought is, at least it might bring people to the original book. Which is where I began. I suspect that my friend also—in the cocoon of his night—becomes young again. We often talk about the impact children’s books have on contemporary young people. Perhaps there is a whole other way of looking at these books. 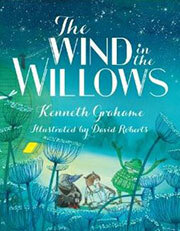 As the population ages, young people’s literature can be a way of recapturing one’s own childhood. If one is a life-long reader, there will be some book or books that remain in hearts and heads, an emotional and literary Garden of Eden. For me, a re-reading of The Wind in the Willows never fails to make me smile, laugh, and to marvel at the brilliance of the writing. Not so much a Fountain of Youth, as a Fountain of Ever Renewing Story. 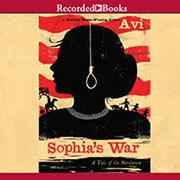 Recently, the recorded version of Sophia’s War was a School Library Journal Pick of the Day. I extend my thanks to the folks at SLJ. Set in 1776 during the American Revolution when New York was under siege by the British, Avi’s tale (S & S/Beach Lane Books, 2012) of resistance features an amazing female protagonist, trials aplenty as she tries to avenge her brother’s death, and a little romance thrown in for good measure. Sophia’s family believes in freedom and desperately wants America to govern itself. Her brother goes off to fight, is captured, and ends up dying in a filthy hold of a British prison boat. John Andre, a charming English officer who is billeted with Sophia’s family, fails to intervene to save her brother. Despite having a schoolgirl crush on Andre, Sophia is conflicted by his failure to save her brother. After witnessing the execution of Nathan Hale, Sophia is determined to help the American cause. Recruited as a spy, she becomes a maid in the home of the commander of the British forces in America. Sophia uncovers some crucial information and sets out to reach West Point before Benedict Arnold can turn it over to the British. Avi’s outstanding text and Angela Goethals’s spot-on narration make the Revolutionary War come alive for listeners, providing a real sense of the time period. A perfect choice for school and public libraries. Grades 5 to 9. 6 cassettes or 6 CDs. 7:15 hrs. Recorded Books. 2012. cassette: ISBN 978-1-4703-2043-0, CD: ISBN 978-1-4703-2042-3. $66.75.